So it’s been awhile. I lived out of a suitcase for the better part of April, May and June. But I’ve settled into my new neighborhood (and new kitchen), and I’m ready to get back to business. Lets start with some Midtown Farmer’s Market inspired meals. This chèvre from Jollity Farms is creamy and mild, unlike its tangier counterparts. It made a delicious topping for peaches and basil, and provided a fresher take on your average cheese and cracker combo. Then there’s the Pasta Queen. She ruled July in my house. I served up “Goat Cheese & Garlic in Roasted Garlic Pasta Ravioli” on my porch (Mom’s idea) with pear tomatoes. And then this week, David and I dined on a divine truffle and mushroom ravioli served with heirloom tomatoes and mixed greens. The Pasta Queen reigns! But in case you don’t come across her majesty, a simple angel hair with pear tomatoes and fresh basil is also delightful. Or fettuccine with rosemary/olive oil-tossed heirloom tomatoes and Parmesan. Buon appetito! Speaking of Heirloom Tomatoes: Tasting this weekend! Last year we attended a charming heirloom tomato tasting in the oak tree-shaded garden of a picturesque farmhouse at Picchetti Winery in Cupertino. It was a picture-perfect Indian summer afternoon, with the added bonus of tasting a rainbow of delicious, organic heirloom tomatoes, olive oil and inspired appetizers. TomatoBash is back this Saturday, September 24 from 1:00-4:00 p.m. – registration details here. It doesn’t hurt that you can pick up a bottle of wine in the tasting room and bring it over to the garden – just keep an eye out for wandering peacocks on the property! 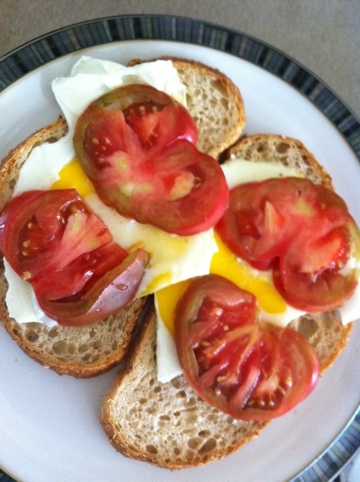 We are getting gorgeous heirloom tomatoes from Farm Fresh to You, so I worked them into our breakfast this morning. Note: make sure the tomato is on the sweeter side, and don’t forget to butter your toast! I also lightly salted the fresh cut tomatoes and eggs while cooking. Heirloom tomato season is coming, get excited! My @farmfreshtoyou delivery arrived and I noticed that heirloom tomato tours are coming in July, which means delicious rainbow-colored tomatoes will follow. We are suckers for caprese salad in the summer months, so to whet our appetite, last night I used a ripe hot house tomato with ricotta in place of mozzarella. Works well, actually. The summer heat has finally hit the Bay Area, which has turned our first tomato red (and produced a second! ), and inspired some warm weather dinners in the Jackson house. Last night, I roasted pork chops with honey, pepper and fresh, sliced apricots in the oven at 400 degrees – which turned out deliciously sweet. I served the pork and juices over rice. Also, pictured below, is our delightful heirloom tomato caprese salad. David takes credit for this concoction. 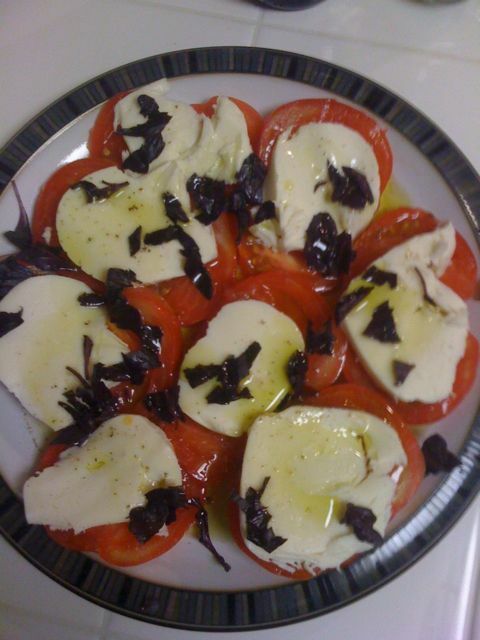 Just drizzle olive oil over sliced, fresh tomatoes and add fresh basil, pepper and mozzarella cheese. Tonight, I made a turkey meatball salad recipe from my archive of Everyday Food recipes. Starting with the basic turkey meatball recipe, you put sliced, roasted bell peppers (from the jar, or homemade) on a bed of lettuce, add the cooked meatballs, and shave parmesan on top of the finished product. 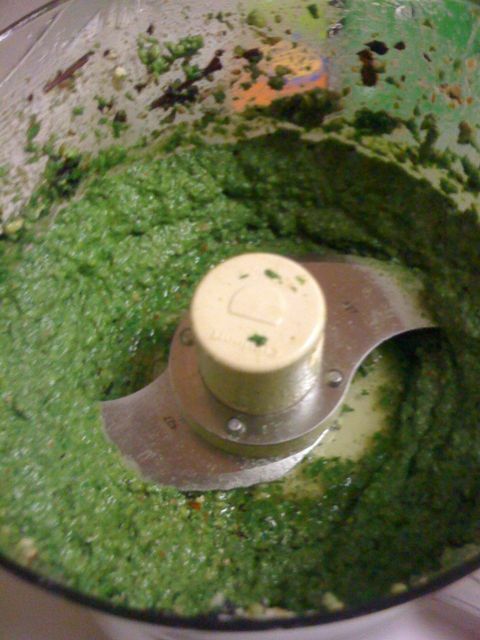 Very light (except for the swirling pool of butter), and easy (of course)!